An exclusive FREE NIGHT offer from the gorgeous Colony Club by Elegant Hotels over Christmas!! With its perfect west coast location, beautifully appointed rooms and suites, great dining options, and that friendly and professional Barbadian service, it’s an ideal stylish getaway . Considered one of “the” addresses in Barbados, Colony Club caters perfectly to couples, friends and families. Stays from December 20th to January 2nd, and MUST include the nights of December 20th-25th, but you can of course stay longer, either departing earlier or returning later. The Colony Club is an established hotel with whitewashed buildings and a colonial ambience, set amongst spacious tropical gardens. Its charming service, friendly approach and beautiful beach make this an ideal holiday for couples and families. Situated on the finest stretch of Barbados’ Platinum (West) Coast, Colony Club is a timeless retreat restored from a former private Colonial Club. The resort is set amongst spacious tropical gardens that reach down to the white sands of Barbados and the calm blue sea, a mere 20 minutes away from Bridgetown, the island’s capital. Activities include complimentary water sports from sailing and paddle boarding to water skiing, tennis and use of the gym facilities. Play a round of golf on one of Barbados’ world class golf courses or indulge in a massage at the resort’s small spa to relax and unwind. 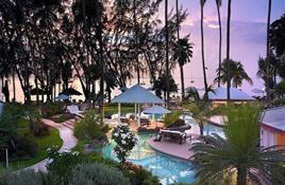 Colony Club’s 96 rooms and suites provide luxury accommodation in one of the most idyllic locations in Barbados. 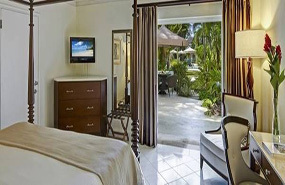 With a private balcony or patio and spacious marble bathrooms, their sophisticated and charming rooms and suites are a relaxing place to take in the essence of the Caribbean on your holiday to Barbados. There are six different types of accommodation – each with individual features as described below – all of the rooms include access to on-site recreational activities. Facilities at the resort include two restaurants (an evening dress code applies), four small freshwater swimming pools, two floodlit all weather tennis courts and air-conditioned gym. Daily children’s activities programmes run during key school holidays, except February. Guests can also take part in the Elegance Dine Around Programme at the Colony Club’s sister hotels along the coast getting there and back with the complimentary water taxi service. There are also weekly manager’s cocktail parties and regular evening entertainment including a fabulous saxophonist. There are many off site tours offered to guests including an island tour on Wednesday from 10am, a guided walk to nearby Holetown on Mondays and Organic garden tours at the hotel with cooking demonstrations. Direct flights from London Gatwick or Manchester with Virgin Atlantic or BA from Gatwick with signature pre-departure airport concierge service in the UK, private car transfers with 7 nights at Colony Club staying on Bed and Breakfast basis in a Pool/Garden View Room, and use of the Executive Lounge at Barbados airport on departure, all from just….